Adam Lambert joined rock legends Queen on stage in London last night to usher in 2015 in style on the BBC show Queen + Adam Lambert Rock Big Ben Live concert. Fans were treated to some Freddie Mercury-esque passion from the singer at the Central Hall in Westminster as the clock counted down to midnight. 2009 American Idol runner up Lambert took his place on stage alongside Roger Taylor and Brian May to blare out classic songs like Don't Stop Me Now and the Show Must Go On. The 2000 strong crowd were loving every minute of it too and were in full party mode. It is fair to say that Lambert surprised quite a few people with the intensity of his performance, especially those who had never seen him perform before. Fans took to Twitter to shower praise on him with @martinceviche saying "Absolutely brilliant performance by @queenwillrock w @adamlambert - perfect way to start 2015" and @DeborahJHicks summed up fans' feelings by tweeting "Two words of hope for any band that loses an irreplaceable front man. Adam. Lambert. @adamlambert @DrBrianMay". Roger Taylor was thrilled to be a part of the BBC event saying beforehand "I never imagined we would be around to usher in the year of 2015, what a thrill! We promise you a great night.". They certainly did not disappoint! 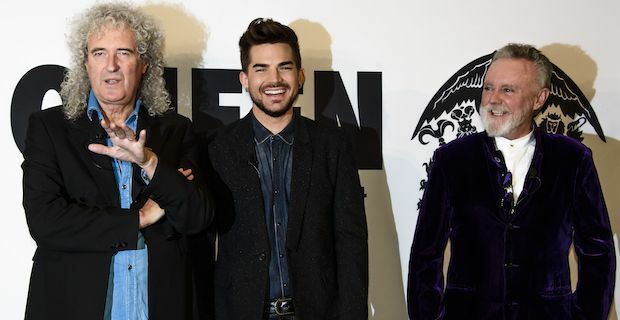 The trio are gearing up to embark on a Queen + Adam Lambert European tour starting in Newcastle on January 13 and culminating with a final date in Sheffield on February 27.